What is a stereo receiver? A stereo audio and video receiver work to function to the extreme of a home theatre. It works at the concept by adding surround sound capability, digital video and audio processing and switching. The stereo receiver refers to an amplifier that has a default built-in radio tuner, it receives an audio signal, amplifies the audio signal that allows passing through of the corresponding video signal that enhances the sound takes it to the next level. Here is my Sony STRDH190 Review. 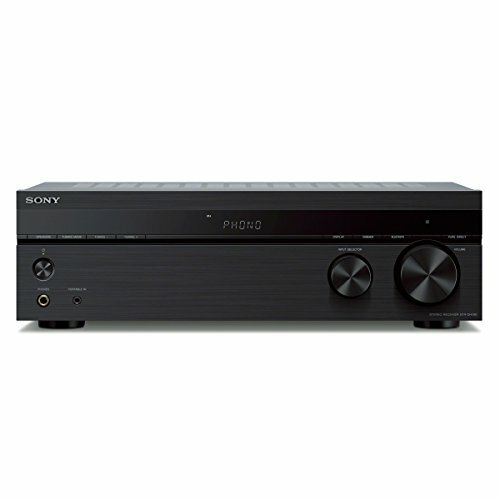 Sony STRDH190 has two channel stereo receivers with phono inputs, four stereo RCA audio inputs. It can connect up to four speakers to deliver high audio quality; it has a low profile design can easily fit anywhere even in a small room. It has a wireless Bluetooth helps to connect wirelessly. Read the complete Sony STRDH190 Review before buying this. Sony STRDH190 has a compact low profile design, overall the size is about 5 ½ inches tall take makes it so convenient that fits easily into conventional AV cabinet. The simple and box designed stereo receiver has a simple and sleek design easily attracts. The black mat finish gives an extra touch to it. The build quality of this stereo receiver is so solid and builds with high-quality material that made it so durable. It has a base stands that keep the contraction from the shelf. It has various button, volume, input selector controller. On the behind, it has various input and output jack ports like FM antenna, Phono, four audio in and out. The expertly designed rigid parts hold the heat sink in place to reduce transmitted vibration from speaker sound pressure. As mentioned in the above design and build quality Sony STRDH190 has various INPUT and OUTPUT options. It has two 100 watts, i.e. 8 ohms and 1 kHz phono Input; the stereo has four separate stereo RCA audio inputs, FM antenna Input and a 3.5 mm Input. Other than this the Stereo receiver has a separate stereo RCA output. This Sony STRDH190 has two one hundred watt phono Input that can be able to connect with four speakers to enhance the default sound that takes audio to the next level. It has a turntable Input and FM radio that makes us enjoy the sweet sound of Vinyl or streaming from your own choice of collection. This will be the perfect match for music lovers seeking a stereo system with classic sound from all your music sources. This receiver brings a new life unto your record collection, and it helps to bring together all the best at once. With both analogue and digital connection, you can easily bind up traditional components like a turntable or CD player other than this you can also enjoy wireless stream music with the help of inbuilt wireless Bluetooth connection. You can connect all your equipment including CD players and recording devices. The smart Bluetooth connection helps you not only to connect with the Sony STRDH190 but also it play all your favourite music tracks, and with the Bluetooth standby, you can also turn your receiver on straight from your paired Smartphone or tablet. Speaking about the sound quality, you can enjoy the subtlest nuances of studio-quality sound in higher than a CD quality with higher resolution audio. The passion of music gets unites every component from signal to speakers with the help of this stereo receiver, so the audio quality feels like the artist performing right in front of you, it gives a truly natural sound. It has a discrete power amplifier and a large capacity power transformer that delivers ample power with 1% distortion and gives a pure sound to up to four speakers. Other than this the receiver has a rigid, frame and beam chassis design reduces the vibration to help and maintain signal fidelity for a more precise, focused and delivered a powerful sound. The brilliant A+B function of this Sony STRDH190 makes you connect two pairs of speakers. You can also switch easily between A or B to playback in two separate rooms, or you can use all of them together in the same room at the same time for higher realistic, high-quality sound. Two 100 watt phono Input. Four stereo RCA audio inputs. 3.5mm Input and Stereo RCA output. FM radio station with 30 stations presets. Gives realist and natural sound quality. Bluetooth has connection problems sometimes. FM antenna has a weaker connection. For people who are bored with regular sound and stereo system and who want to inbuilt a great audio quality inside their room can easily go for this Sony STRDH190. This brings out realistic and delivers natural sound that feels like the artists playing in front of you. This can easily connect with four speakers so you no need to worry about the low volume, it easily gives you the party sound for house parties. And with the help of a discrete amplifier and a large capacity power transformer, it reduces all the noise and distortion for a clean and flawless musical experience. This will be a treat to all musical loves and it fits continently.